Marsupial moles are highly specialized marsupial mammals, known from two species found at the Australian interior. Notoryctes typhlops (southern marsupial mole, known as the itjaritjari by the Pitjantjatjara and Yankunytjatjara people in Central Australia). Notoryctids are small, fossorial mammals that anatomically converge on other fossorial (and distantly related) mammals, such as living golden moles (Chrysochloridae) and extinct epoicotheres (Pholidota). Like chrysochlorids and epoicotheres, notoryctids utilize their forelimbs and enlarged central claws to dig in a parasagittal (i.e., up and down) plane, as opposed to the "lateral scratch" style of digging that characterizes talpid moles. Marsupial moles spend most of their time underground, coming to the surface only occasionally, probably mostly after rains. They are blind, their eyes having become reduced to vestigial lenses under the skin, and they have no external ears, just a pair of tiny holes hidden under thick hair. The head is cone-shaped, with a leathery shield over the muzzle, the body is tubular, and the tail is a short, bald stub. They are between 12 and 16 centimetres (4.7–6.3 in) long, weigh 40 to 60 grams (1.4–2.1 oz), and are uniformly covered in fairly short, very fine pale cream to white hair with an iridescent golden sheen. Their pouch has evolved to face backwards so it does not fill with sand, and contains just two teats, so the animal cannot bear more than two young at a time. The limbs are very short, with reduced digits. The forefeet have two large, flat claws on the third and fourth digits, which are used to excavate soil in front of the animal. The hindfeet are flattened, and bear three small claws; these feet are used to push soil behind the animal as it digs. Epipubic bones are present but small and as in some other fossorial mammals (e.g., armadillos), some of the neck vertebrae are fused to give the head greater rigidity during digging. The molar teeth of Notoryctes are triangular, or "zalambdodont", i.e., resembling an inverted Greek letter "lambda" in occlusal view. Notoryctids are represented by early Miocene fossils of Naraboryctes from site of Riversleigh in Queensland, Australia, which document the mosaic acquisition of dental and skeletal features of the living Notoryctes from a more terrestrial ancestor. The notoryctid fossil record demonstrates that the primary cusp of the molars is the metacone, distinct from the paracone characteristic of zalambdodont tenrecs, golden moles, and Solenodon. Regarding the number of teeth in each dental quadrant (or dental formula) Archer et al. (2011) reported that "the dental formula for species of Notoryctes is controversial because of considerable polymorphism in tooth number, both between specimens and within the same specimen." Nonetheless, reflecting the consensus of older studies, Archer et al. (2011) report the presence of four molars (typical for marsupials) in each quadrant both in living Notoryctes and the fossil notoryctid Naraboryctes. American paleontologist William King Gregory wrote in 1910 (p. 209) that "Notoryctes is a true marsupial" and this view has been repeatedly verified by phylogenetic analyses of comparative anatomy, mitochondrial DNA, nuclear DNA, rare genomic events, and combined datasets of nuclear and mitochondrial DNA and morphology and DNA. 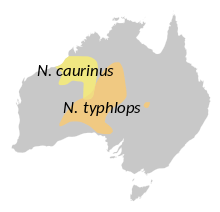 The largest phylogenetic datasets strongly support the placement of Notoryctes as the sister taxon to a dasyuromorph-peramelian clade, within the Australidelphian radiation. ^ Groves, C.P. (2005). Wilson, D.E. ; Reeder, D.M. (eds.). Mammal Species of the World: A Taxonomic and Geographic Reference (3rd ed.). Baltimore: Johns Hopkins University Press. p. 22. ISBN 0-801-88221-4. OCLC 62265494. ^ Warburton N. Functional morphology and evolution of marsupial moles (Marsupialia: Notoryctemorphia). 2003. PhD Dissertation, University of Western Australia. ^ "Mole Patrol". The Marsupial Society. 2004. Retrieved 2006-11-09. ^ Yalden DW. The anatomy of mole locomotion. Journal of Zoology. 1966 May 1;149(1):55-64. ^ Rose KD, Emry RJ. Extraordinary fossorial adaptations in the Oligocene palaeanodonts Epoicotherium and Xenocranium (Mammalia). Journal of Morphology. 1983 Jan 1;175(1):33-56. ^ Asher RJ, Horovitz I, Martin T, Sanchez-Villagra MR. Neither a rodent nor a platypus: a reexamination of Necrolestes patagonensis Ameghino. American Museum Novitates. 2007 Jan 15:1-40. ^ Gordon, Greg (1984). Macdonald, D. (ed.). The Encyclopedia of Mammals. New York: Facts on File. p. 842. ISBN 978-0-87196-871-5. ^ a b Archer, M. (2011-05-22). "Australia's first fossil marsupial mole (Notoryctemorphia) resolves controversies about their evolution and palaeoenvironmental origins". Proceedings of the Royal Society of London B: Biological Sciences. 278 (1711): 1498–1506. doi:10.1098/rspb.2010.1943. PMC 3081751. Retrieved 2017-02-26. ^ Asher RJ, Sánchez-Villagra MR. Locking yourself out: diversity among dentally zalambdodont therian mammals. Journal of Mammalian Evolution. 2005 Jun 1;12(1):265-82. ^ Thomas O. XI.—Notoryctes in North-west Australia. Journal of Natural History. 1920 Jul 1;6(31):111-3. ^ Horovitz I, Sánchez-Villagra MR. A morphological analysis of marsupial mammal higher‐level phylogenetic relationships. Cladistics. 2003 Jun 1;19(3):181-212. ^ Beck RM, Warburton NM, Archer MI, Hand SJ, Aplin KP. Going underground: postcranial morphology of the early Miocene marsupial mole Naraboryctes philcreaseri and the evolution of fossoriality in notoryctemorphians. Memoirs of Museum Victoria. 2016;74:151-71. ^ Springer MS, Westerman M, Kavanagh JR, Burk A, Woodburne MO, Kao DJ, Krajewski C. The origin of the Australasian marsupial fauna and the phylogenetic affinities of the enigmatic monito del monte and marsupial mole. Proceedings of the Royal Society of London B: Biological Sciences. 1998 Dec 22;265(1413):2381-6. ^ Burk A, Westerman M, Kao DJ, Kavanagh JR, Springer MS. An analysis of marsupial interordinal relationships based on 12S rRNA, tRNA valine, 16S rRNA, and cytochrome b sequences. Journal of Mammalian Evolution. 1999 Dec 1;6(4):317-34. ^ Kjer KM, Honeycutt RL. Site specific rates of mitochondrial genomes and the phylogeny of eutheria. BMC Evolutionary Biology. 2007 Jan 25;7(1):8. ^ Amrine-Madsen H, Scally M, Westerman M, Stanhope MJ, Krajewski C, Springer MS. Nuclear gene sequences provide evidence for the monophyly of australidelphian marsupials. Molecular Phylogenetics and Evolution. 2003 Aug 31;28(2):186-96. ^ Meredith RW, Janečka JE, Gatesy J, Ryder OA, Fisher CA, Teeling EC, Goodbla A, Eizirik E, Simão TL, Stadler T, Rabosky DL. Impacts of the Cretaceous Terrestrial Revolution and KPg extinction on mammal diversification. Science. 2011 Oct 28;334(6055):521-4. ^ Nilsson, M. A.; Churakov, G.; Sommer, M.; Van Tran, N.; Zemann, A.; Brosius, J.; Schmitz, J. (2010). "Tracking Marsupial Evolution Using Archaic Genomic Retroposon Insertions". PLoS Biology. Public Library of Science. 8 (7): e1000436. doi:10.1371/journal.pbio.1000436. PMC 2910653. PMID 20668664. ^ Phillips MJ, McLenachan PA, Down C, Gibb GC, Penny D. Combined mitochondrial and nuclear DNA sequences resolve the interrelations of the major Australasian marsupial radiations. Systematic Biology. 2006 Feb 1;55(1):122-37. ^ Asher RJ, Horovitz I, Sánchez-Villagra MR. 2004. First Combined Cladistic Analysis of Marsupial Mammal Interrelationships. Molecular Phylogenetics and Evolution 33: 240-250. ^ Beck RM, Godthelp H, Weisbecker V, Archer M, Hand SJ. Australia's oldest marsupial fossils and their biogeographical implications. PLos one. 2008 Mar 26;3(3):e1858. ^ O’Meara RN, Thompson RS. Were there Miocene meridiolestidans? Assessing the phylogenetic placement of Necrolestes patagonensis and the presence of a 40 million year meridiolestidan ghost lineage. Journal of Mammalian Evolution. 2014 Sep 1;21(3):271-84. ^ Mitchell KJ, Pratt RC, Watson LN, Gibb GC, Llamas B, Kasper M, Edson J, Hopwood B, Male D, Armstrong KN, Meyer M. Molecular phylogeny, biogeography, and habitat preference evolution of marsupials. Molecular biology and evolution. 2014 Sep 1;31(9):2322-30. This page was last edited on 30 March 2019, at 19:24 (UTC).